Ok, now it looks like a lot of holes. 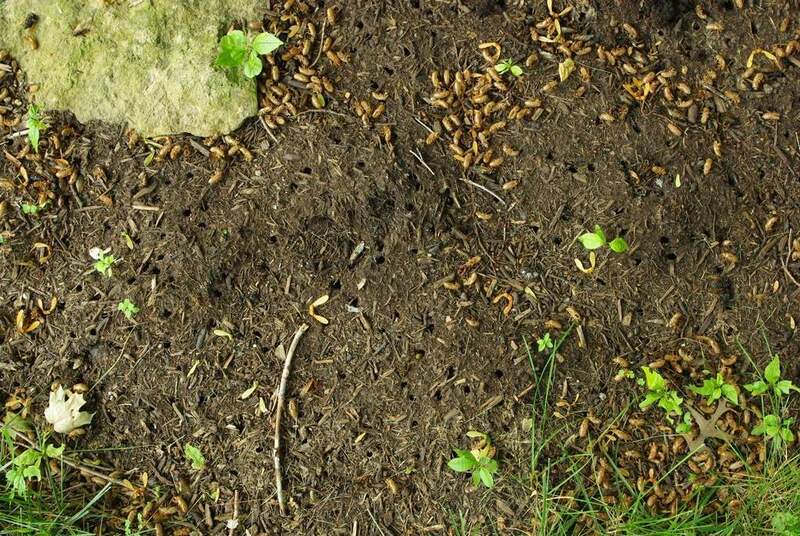 Thanks for aerating my beds for me cicadas! This is just around a single tree. 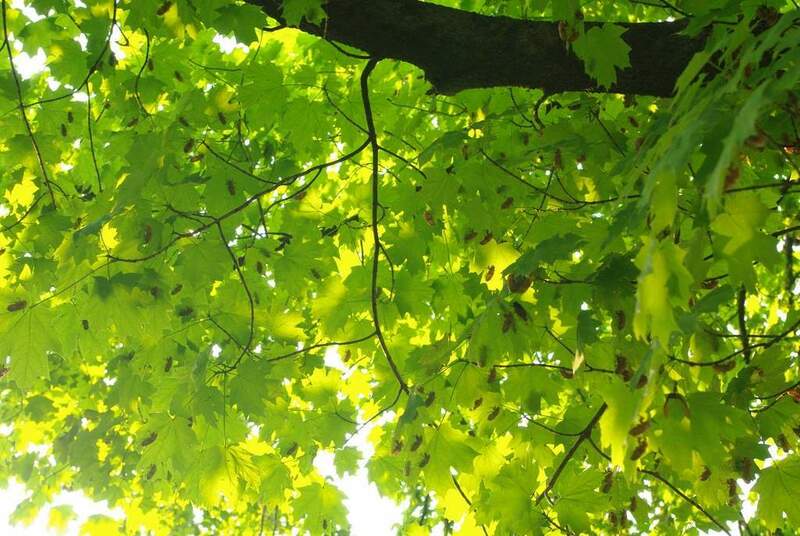 There are a lot of trees in my yard and in my neighborhood. 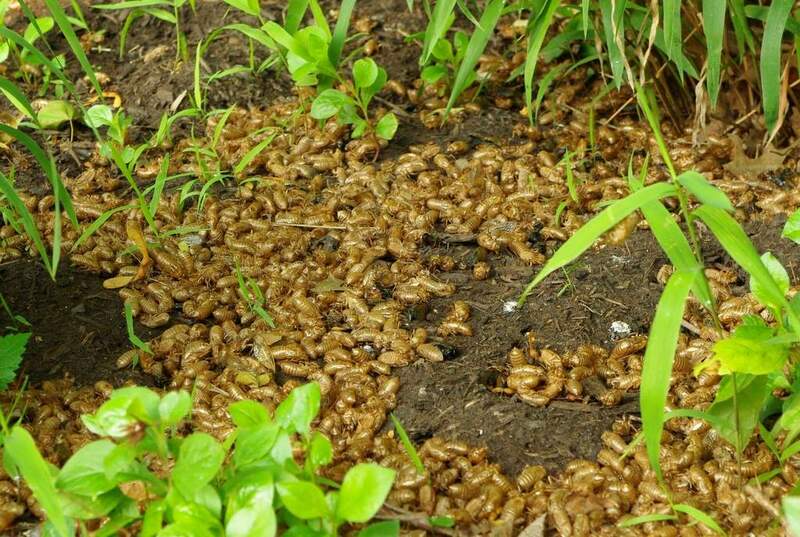 Add it up (or multiply) and that's a lot of cicadas. 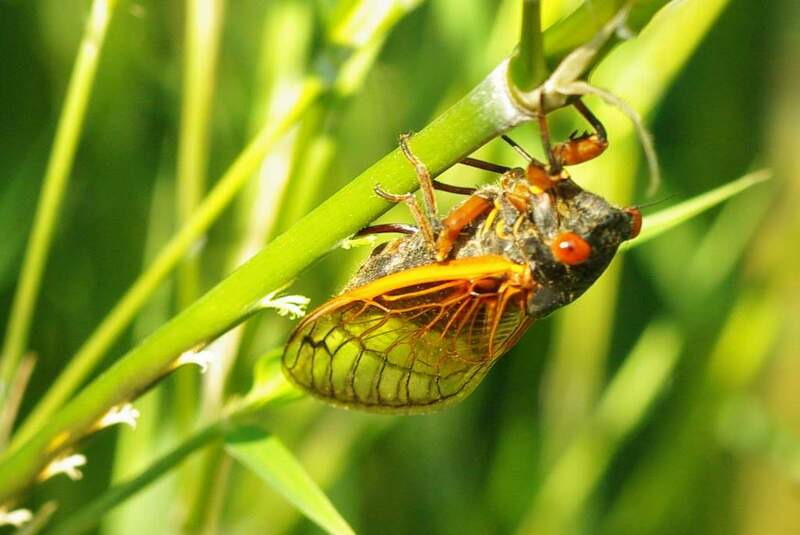 A single female cicada can't do much damage. 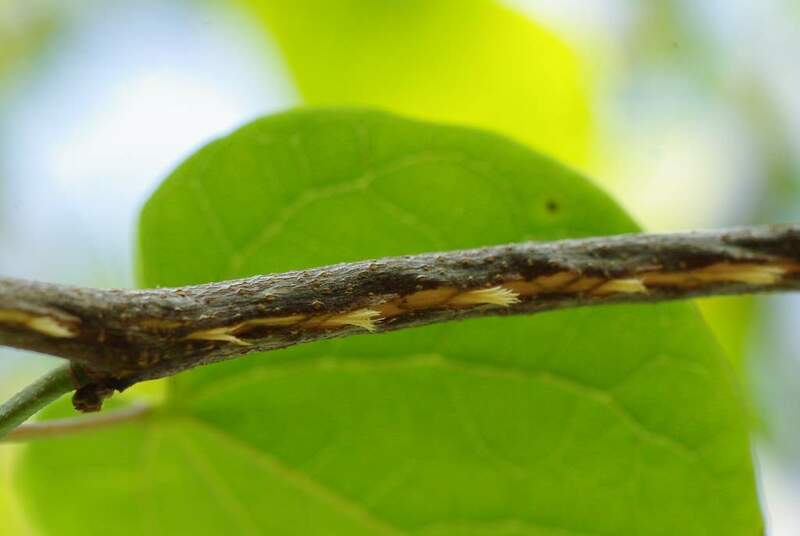 Her eggs are laid in tiny slits in the bark of young but woody branches, and those slits are small wounds. I'm not sure how many slits a female makes, but it looks like a dozen or so at a time. 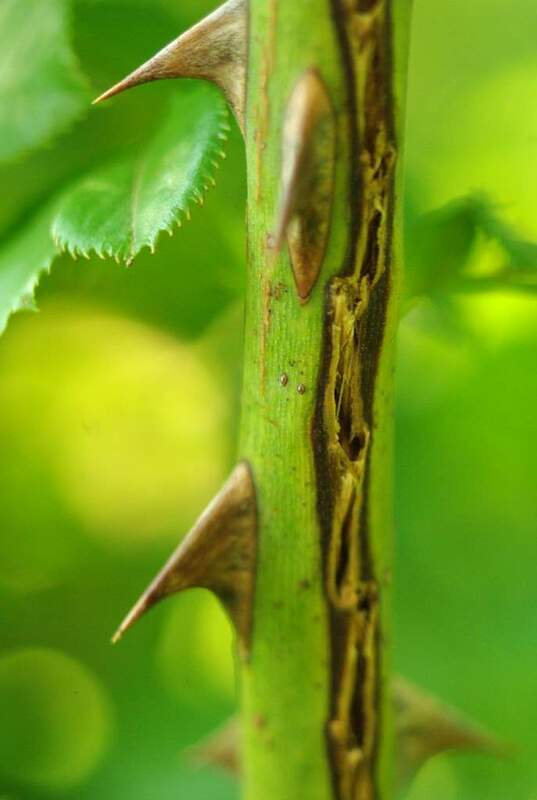 Multiply that by the number of laying females that use this same branch... 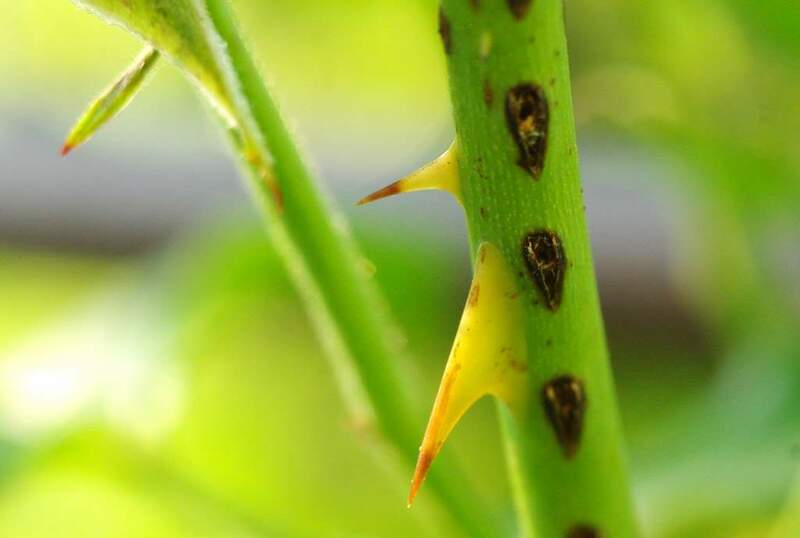 Hundreds or thousands of small wounds can be just as bad as one or two larger ones. So how exactly do they make these slits? The amount of pressure they are able to exert must be enormous! I'm not sure if they lay a single egg in each slit, but I'm thinking they probably do. 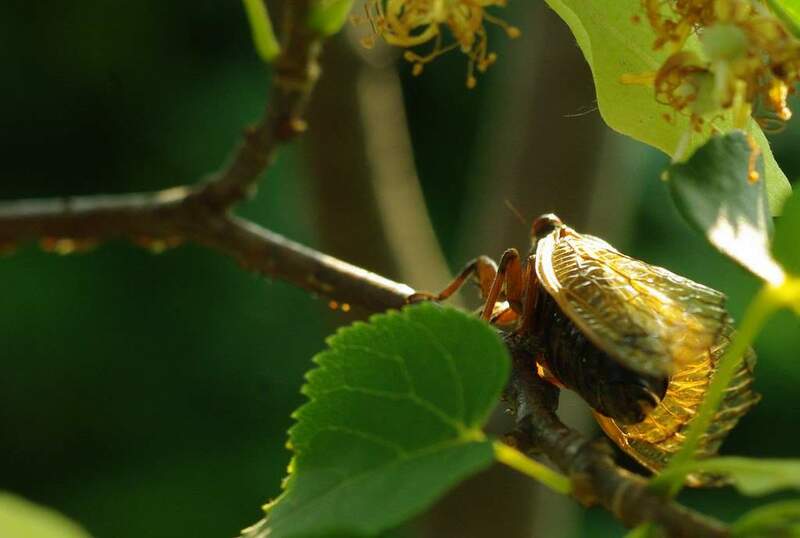 I'm quite glad that cicadas are good at identifying appropriately woody branches, as I'd hate to have them mistake my leg for a twig -- I'm pretty sure they could drill with ease into any part of my body they wanted, skull included. Great, now I'll be thinking about that whenever one lands on me -- and that occurs a lot. 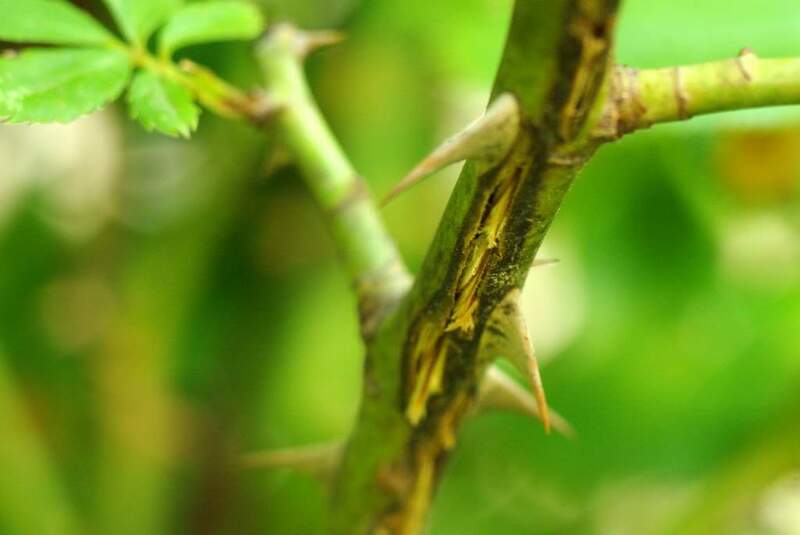 Are these in your garden or in your neighbor's garden? Very much as I love bugs, these are definitely overwhelming. I've since found out that the female will lay up to 20 eggs in each slit, and that they take 6-8 weeks to hatch. I like bugs but I'm not sure about these ones. Something to do with the potruding red eyes..
Wow...that's incredible. Thanks for the detailed photos...very interesting. 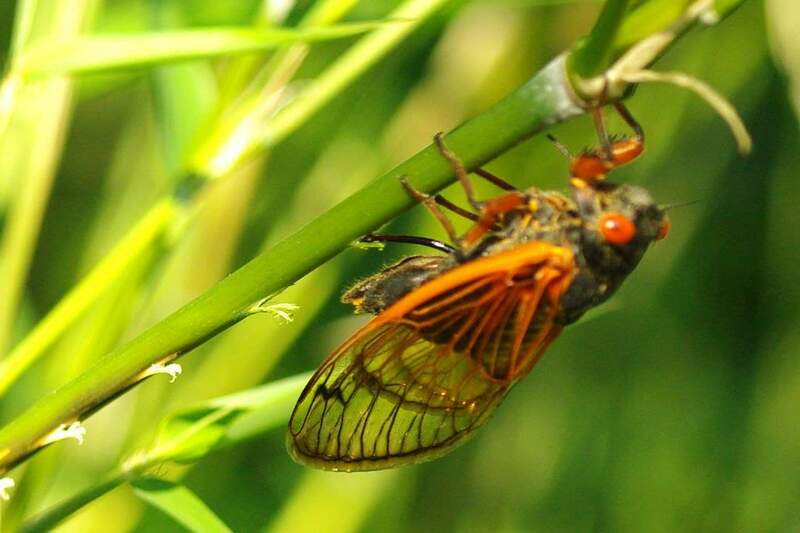 You've done an excellent job describing the cicadas in your posts, just finished reading all of them... amazing. 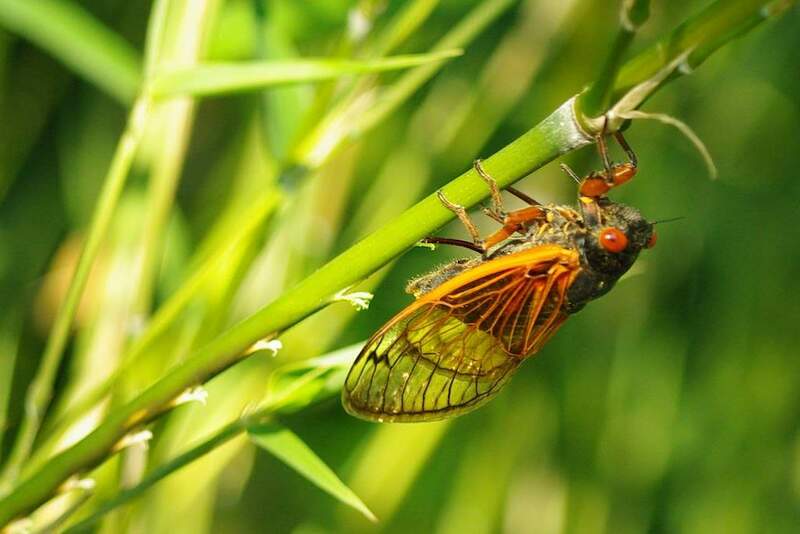 So happy to have only annual cicadas in my neck of the woods. 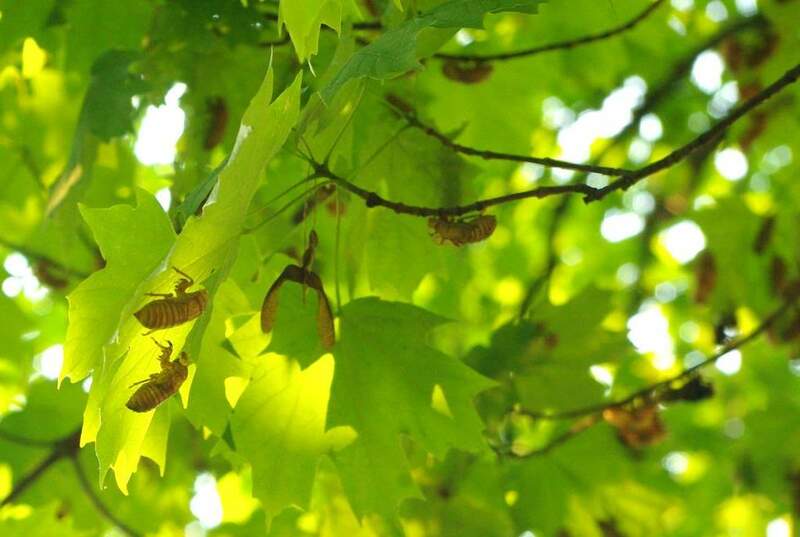 I have never seen cicadas in that population before. 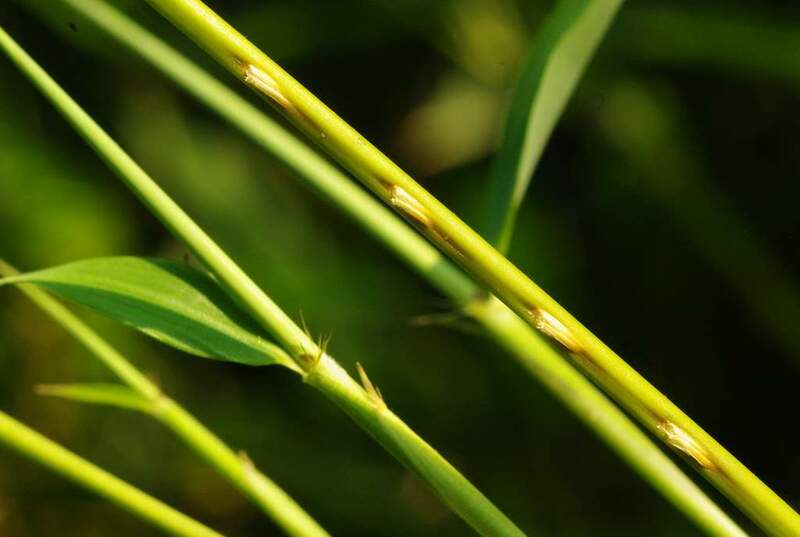 Do they choose new bamboo branches or older harden off growth from years past? I'd assume the new bamboo growth would not be "woody" enough for them. 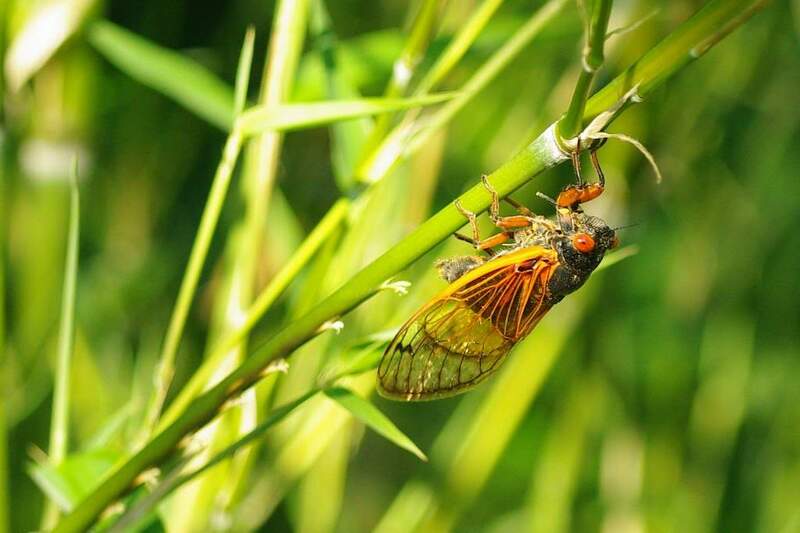 The photos of the cicada are really good. M: They're definitely using some of the new branches -- and it's causing some problems. I'll post about this tomorrow. Not sure if they're using older branches too -- I need to survey more. Are you into Chinese medicine because you could collect all those shells. 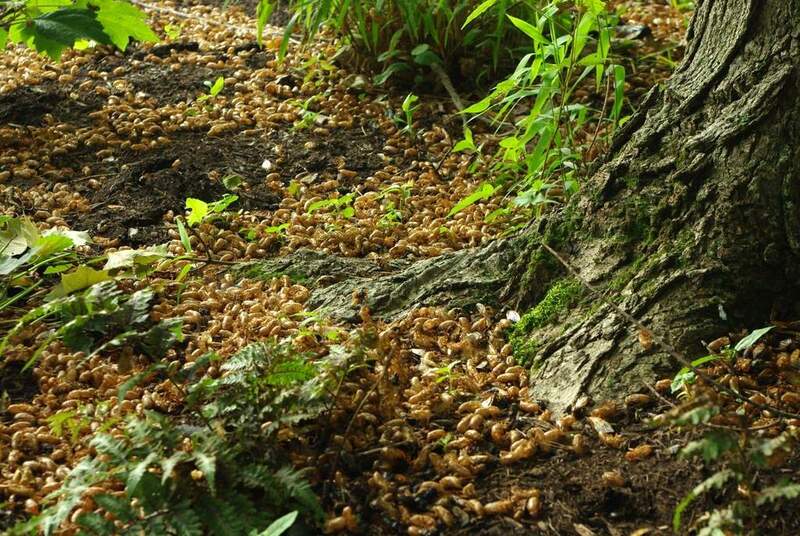 :) Seriously, those are a lot of cicada shells!!! 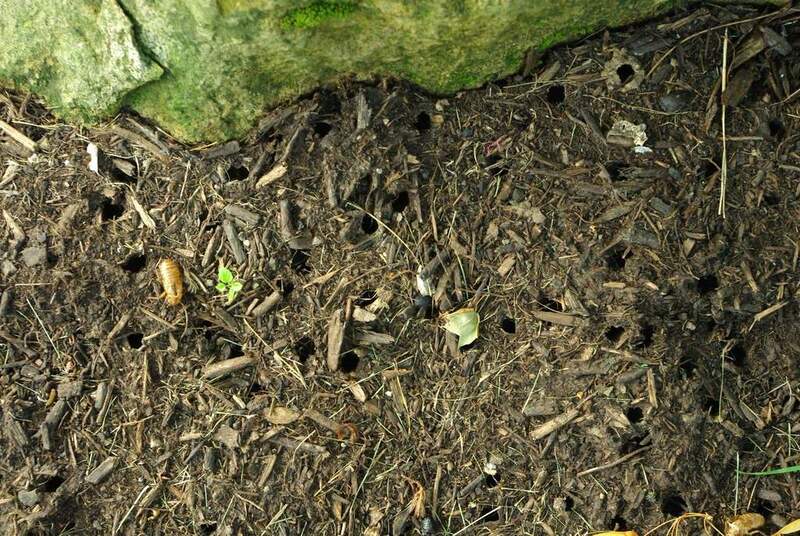 I hear them and see evidence of holes in the ground but NEVER seen so many as you have. 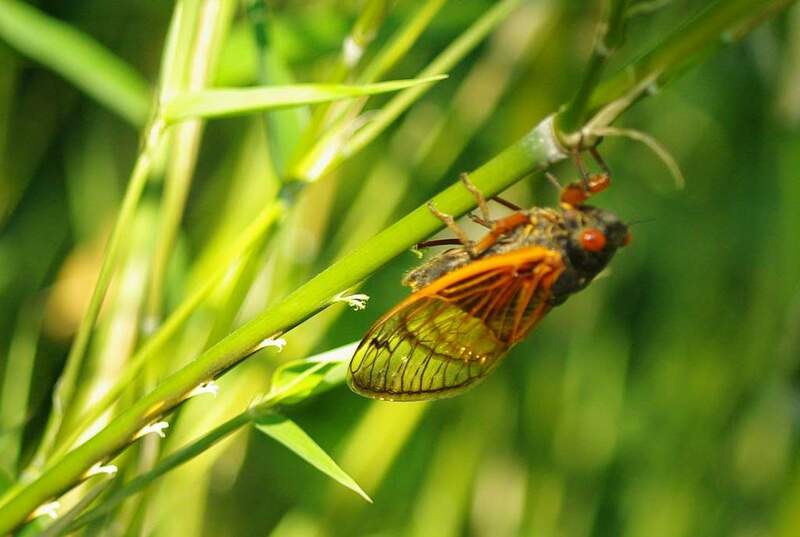 Very impressive photos of the cicadas and interesting info on their egg laying. I hope your plants survive the invasion. At least this type only comes every 13 years! 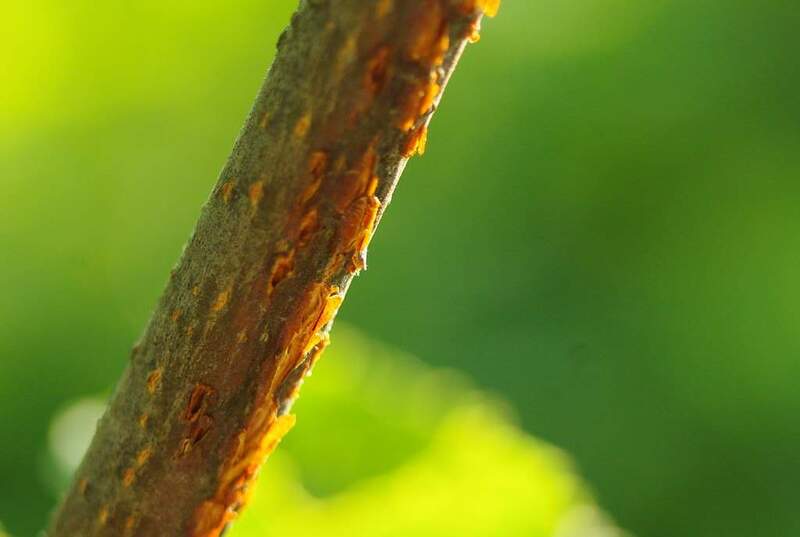 I noticed marks on some of my plants. Now that I've seen your amazing photos of the female laying eggs, I put on my reading glasses to look again. 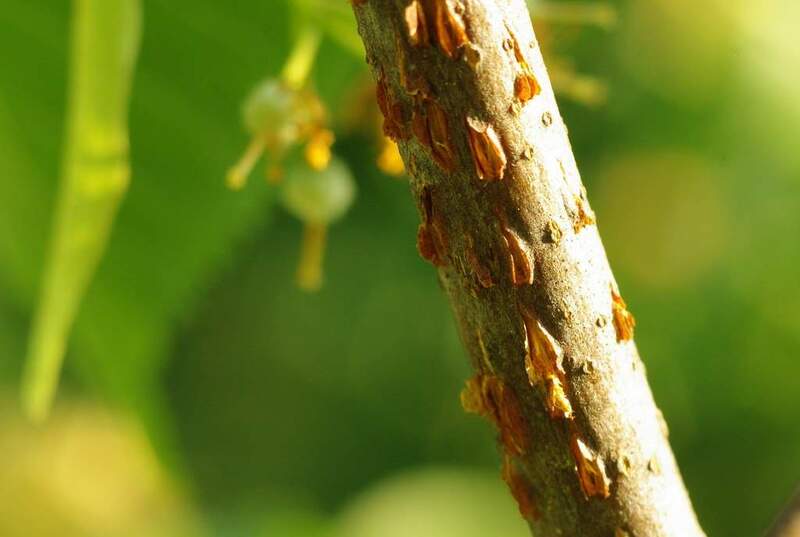 Sure enough, they're everywhere, and not only on woody plants. Excellent post! 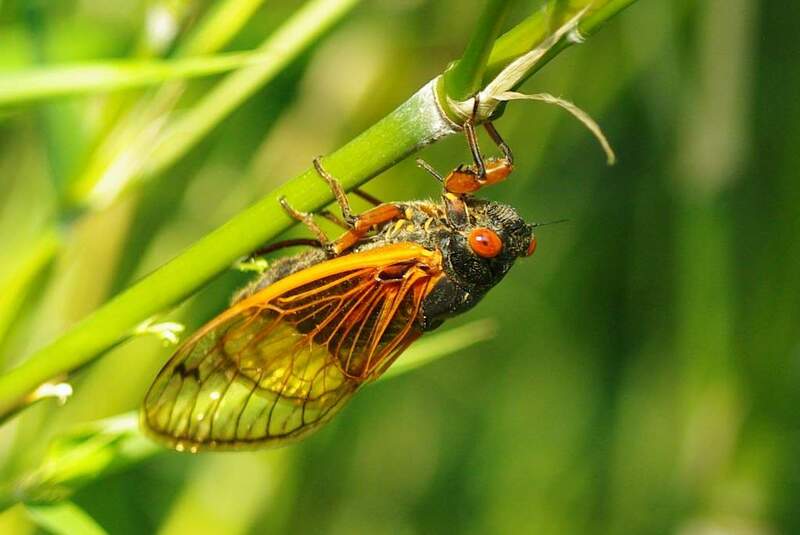 I just found your blog from a Google search on cicada branch flagging. Your pictures are amazing, especially the one of the egg-laying female. 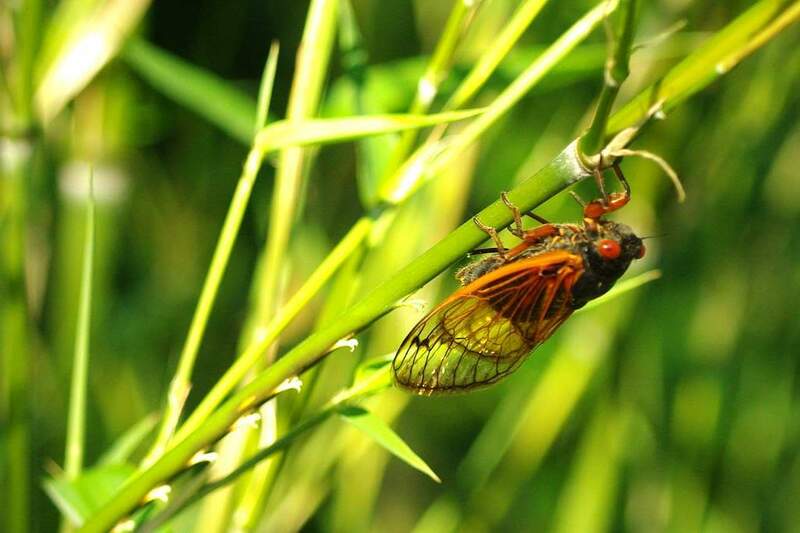 In my part of St. Louis county, they were so bad I spent most of the time inside, not wanting any cicadas to fly into me. I'm glad they're gone.